Are you ready to waddle? The annual Toddle Waddle in aid of the Meningitis Trust will take place in creches and playschools during October this year. The Trust is one of the charities we support here at PuddleDucks and we’re delighted to do our bit in publicising the event. We will also enclose a Toddle Waddle brochure with all of the orders we send out over the next few weeks. During the month of October, along with rugby hero Brian O’Driscoll, Ireland’s nation of toddlers will be out in force for the annual Meningitis Trust Toddle Waddle. Register by logging on to www.meningitis-trust.ie, by emailing Monty@meningitis-trust.ie or you can call the Trust’s hotline on 01 2764269 to receive a registration pack. Over 8,000 children along with their minders have waddled around their local areas in recent years and have raised over €400,000 in sponsorship. 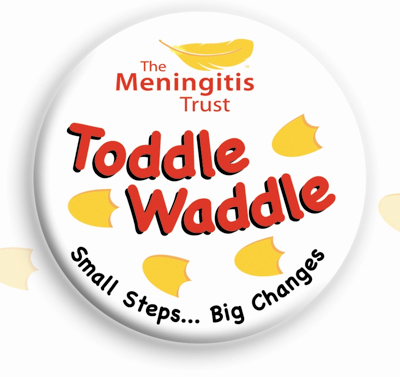 Every cent raised during Toddle Waddle month means that more families who are affected by this terrible disease can get the help they need from the Meningitis Trust including counselling and Community Nurse services. Around 250 to 300 cases of bacterial meningitis occur every year in Ireland and there are probably more than double that number of cases of viral meningitis. Children under 5 are regarded as a particularly at risk group and according to recent research, meningitis is the disease most feared by parents. Register today for your Toddle Waddle and get those little ducklings quacking!